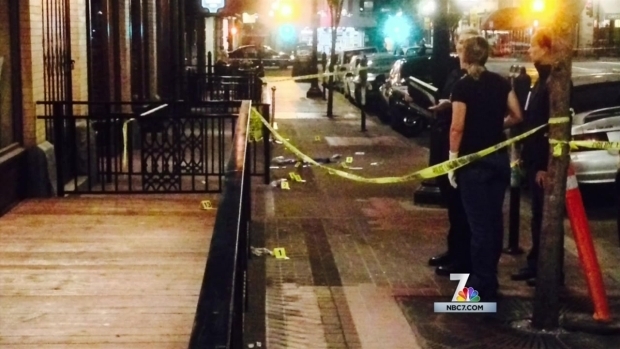 San Diego police are looking for four people in connection to a deadly attack in the Gaslamp District. In the early morning hours of June 15, 25-year-old Michael Beaver was found unconscious on a sidewalk in the 500 block of F Street. He later died at the hospital. Police believe Beaver got into an altercation with two men and a woman. Suspect No. 1 is described as about 6-foot tall and 175 to 190 pounds with a moustache, long dreadlocks in a ponytail and black rimmed glasses. He was wearing a green V-neck sweater with dark jeans. The second suspect is said to be 5-foot-7 to 5-foot-9 and 180 to 190 pounds with facial hair and a bushy ponytail. He had on a white short-sleeved collared shirt, a green baseball cap with an emblem and black bill, and dark jeans. Suspect No. 3 is a woman with short, curly hair who was wearing a blue dress and jean jacket. She is around 5-foot-6 and 130 to 140 pounds. Police said the fourth person of interest wasn’t involved in the attack, but was with the other three suspects. She is between 5-foot-7 and 5-foot-9 and 120 to 130 pounds with long, straight hair. She had on a green blazer and skirt. All the suspects appear to be between 20 and 30 years old. Anyone with information is asked to call SDPD’s Homicide Unit at 619-531-2293 or Crime Stoppers at 888-580-8477.